This year, Chanukah, the Jewish Festival Of Lights, begins the evening of December 12th (the 25th day of the month of Kislev on the Hebrew calendar). In ancient Judea, the Syrian King Antiochus ordered the Jewish people to abandon their religion and worship the Greek gods. In 165 B.C.E., Judah, leader of the band that called themselves the Maccabees (Hebrew for hammer), drove the Syrians from Israel and reclaimed the Second Temple in Jerusalem, removing the Greek statues. When they finished their work, on the 25th day of the month of Kislev, they wanted to rededicate the temple by lighting the eternal light (N’er Tamid), a candelabra that is present in every Jewish house of worship. Once lit, the light should never be extinguished. But there was only a tiny jug of lamp oil—enough for a single day. There was no more purified* oil to be had. A miracle occurred: The light burned for eight days. To acknowledge the miracle of the oil, foods fried in oil, like latkes, are celebratory fare for Chanukah; as are sufganiyah, jelly donuts; and loukoumades, deep-fried puffs dipped in honey or sugar (oy, the carbs!). 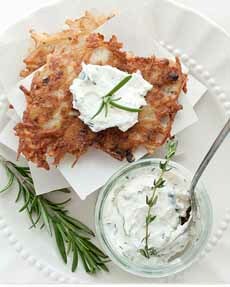 Potato latkes are a Chanukah tradition, but they are enjoyed year-round by Ashkenazi† Jews during. Latkes are not an ancient food (the word means “fried cakes,” i.e. pancakes, in Yiddish). The fried potato pancakes of European Jewish cuisine descend from sweet Sicilian ricotta pancakes that appeared in the Middle Ages (and evolved in Jewish cooking into cheese blintzes). They traveled north to Rome, where the Jewry called them cassola. Here’s a recipe for ricotta latkes. While traditionally sweet, you can make a savory version with herbs instead of sugar. Potato latkes are an Ashkenazi invention that gained popularity in Eastern Europe during the mid 1800s. For centuries, potato latkes were the rule. Toward the end of the 20th century, adventurous cooks bucked the tradition with sweet potato latkes. Then, anything was possible: latkes from beets, carrots, celery root, parsnips…If it’s a root vegetable, it can be turned into latke. You can also use non-root vegetables, like summer and winter squash. Whether or not you celebrate Chanukah (in our upbringing, we celebrated every holiday that had a food focus, regardless of religion or nationality), if you like fried potatoes, Chanukah is your opportunity to try eight days of different recipes and toppings. The latter range from the traditional sour cream or apple sauce, and luxury toppers like smoked salmon and caviar (photo #4). They can be served as a first course, a side, with the salad course, and as mini-bites with cocktails (photo #2). 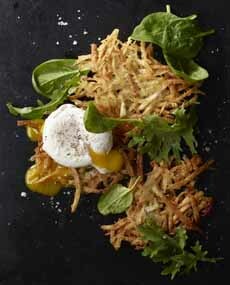 Or, serve breakfast latkes with poached eggs: the Chanukah version of home fries (photo #5). 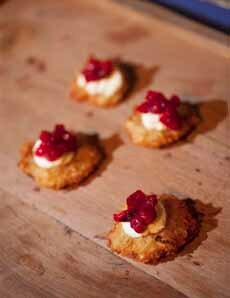 Modern potato latkes with ginger and herbed goat cheese (here’s the recipe by Anne Druart for Vermont Creamery). 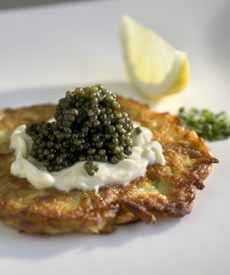 Potato latke with caviar: If only we could afford it (photo Tsar Nicoulai). 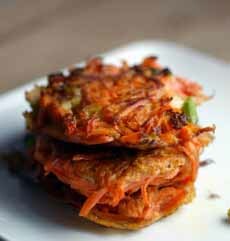 Gluten-free carrot-scallion latkes. Here’s the recipe from Elana’s Pantry. Breakfast latkes, with a poached or fried egg. Here’s the recipe from IdahoPotato.com. *For temple lamps, ritually pure olive oil was required. It took time to prepare: By religious law, the olives could not be pressed. Instead, choice olives were pounded and left to sit for several days, enabling the oil to drain out naturally—but very slowly. The yield for this special olive oil was (and is) very low [source]. So the Maccabees had to wait for new batches to be prepared. †Askenazi are a Jewish diaspora population who coalesced as a distinct community in the Holy Roman Empire around the end of the first millennium. They settled along the Rhine River, in Western Germany and Northern Franc [source]. Sephardim (Sephardic Jews) are the other major Jewish ethnic division. It emerged as a distinct community on the Iberian Peninsula, around 1000 C.E. They established communities throughout Spain and Portugal, and, exiled in the late 15th century, migrated to North Africa, Anatolia, the Levant, Southeastern and Southern Europe, and the Americas [source].